As a Nor'easter heads towards the east coast just in time for the busiest travel day of the year, you're probably wondering how bad it has to get before your plane gets grounded. Well, as a new National Geographic feature explains, figuring that out is more an art than a science. Suffice it to say, these decisions are made on a case-by-case basis. Airplanes are built to fly in pretty serious conditions, but it's the combination of bad conditions that keep planes from taking off. Planes can fly in crosswinds as high as 25 knots, for instance, but if there's ice on the runway, that figure is much lower. Snow's not a problem unless there's some serious accumulation. 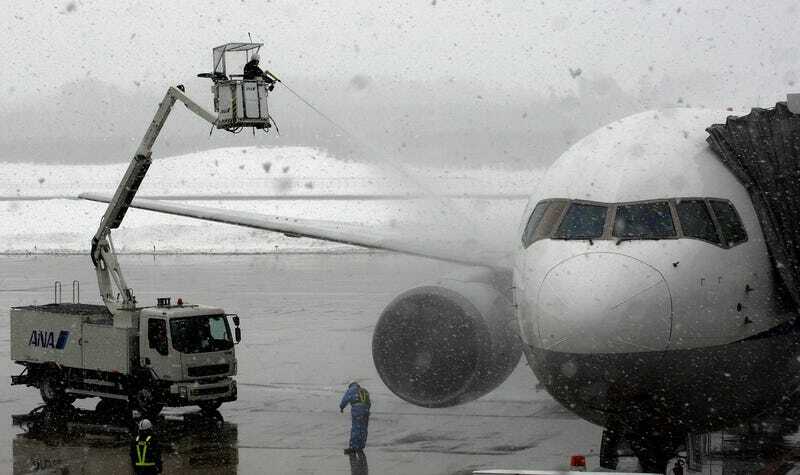 What planes can't handle, NatGeo explains, is freezing rain. So, weirdly enough, you might just want to wish for flurries.